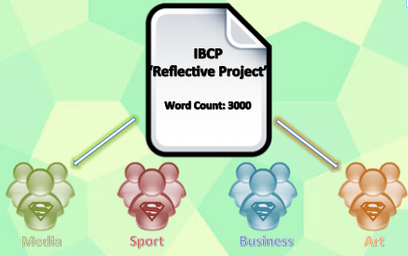 ﻿The IBCP Reflective Project is an in-depth body of work produced over an extended period and submitted in year 2 of the career-related programme. Through the Reflective Project, students identify, analyse, discuss and evaluate an ethical dilemma associated with an issue from their career-related studies. This work encourages students to engage in personal inquiry, intellectual discovery, creativity, action and reflection, and to develop strong thinking, research and communication skills. The Reflective Project is assessed using grades A to E, with A representing the highest level of achievement. A minimum of 50 hours is expected to be devoted to the essay. Again, just like the DP you will receive a supervisor from your career-related area of study. The first role of the Reflective Project supervisor is to provide guidance in areas of ethical concerns in their BTEC studies. The second is to provide support with research, analysis, discussion and evaluation of the students findings around that area of ethical study. Students must communicate for regular 1-1’s with their supervisor, they will also benefit from a collapsed-curriculum day. A written essay (maximum 3,000 words). The written essay should cover all the reflective project’s requirements except reflection, which forms the content of the RPPF. A written essay (1,500–2,000 words) accompanied by an additional format (film, oral presentation, interview, play, or display). Together, the written essay and additional format should cover all the reflective project’s requirements except for the reflection. - a short film (7 minutes). You are free to create whatever type of film you believe will be a valuable component of your reflective project: for example, a documentary, a drama, a news report and so on. You can also choose to submit a written film script instead (700 words). - a spoken presentation (recorded on audio/video; 7 minutes). A presentation provides you with the opportunity to address in a spoken format aspects of your reflective project You can also choose to submit a written script instead (700 words). an interview (recorded on audio/video; 7 minutes). An interview allows you to be creative by imagining and developing a discussion between two or more people. You can also choose to submit a written script instead (700 words). - a play (recorded on audio/video; 7 minutes). The play should include one or more characters performing a spoken drama that supports elements of the reflective project. It can include dialogue, music and sound effects. You can choose to submit a written script instead (700 words). - a display (a storyboard or photo essay using up to 15 annotated images; 700 words.) A storyboard/photo essay is usually a linear narrative told through imagery. You can decide what your imagery will accomplish and how it will contribute to the reflective project overall. For example, it could provide an overview of your reflective project and create points of discussion or illustrate particular ideas. The chosen additional format should support and add information to the reflective project overall. For example, a film or presentation could reflect the different perspectives of the stakeholders involved, or detail the local/global manifestation of the issue, while the written essay contains the central argument(s) of the ethical dilemma. Crucially, the content of the additional format must be different from the essay. For example, you should not take an argument presented in the essay and then repeat it in the additional format. The two elements should complement each other, each adding value to the other ensuring that as an overall submission the assessment criteria are satisfied. Repetition or simply reformatting information will lose you marks. drop the reflective project coordinator an email with any questions that you may have. 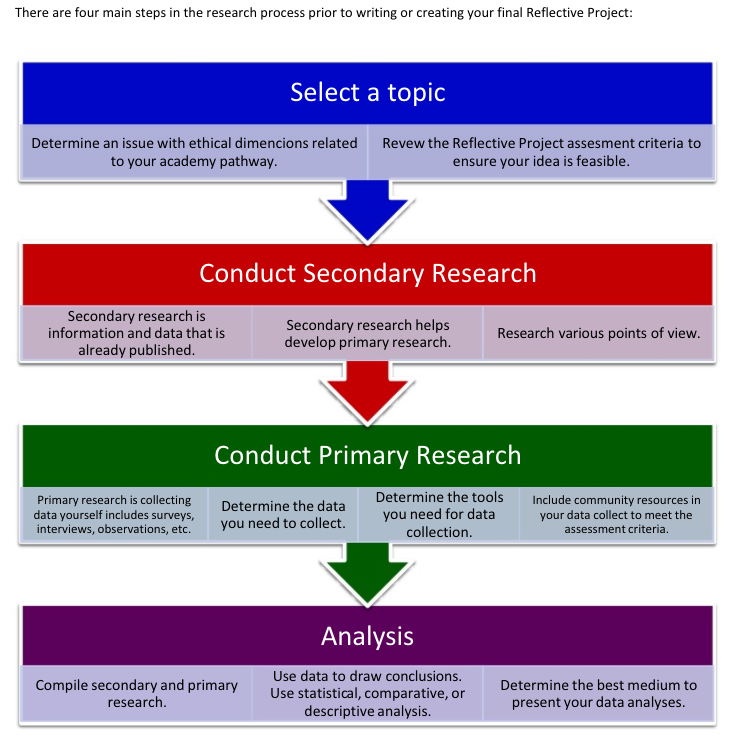 The Reflective Project 'Student Guide' is an essential document to support students on the process. Please download this here. Your deadlines are highlighted in RED, you will receive reminders on these via the Reflective Project Google Classroom calendar. The Google Classroom will also house all resources from support sessions, all submissions of work, your RRS extracts and RPPF documentation. You will be added to this classroom along with your supervisor who can monitor your progress at any time. Click on the button below for a quick link. The reflective project should be one of the best pieces of work that you have ever produced. Therefore, you need to move away from website & textbook resources and start to consider online journals and other e-documents. 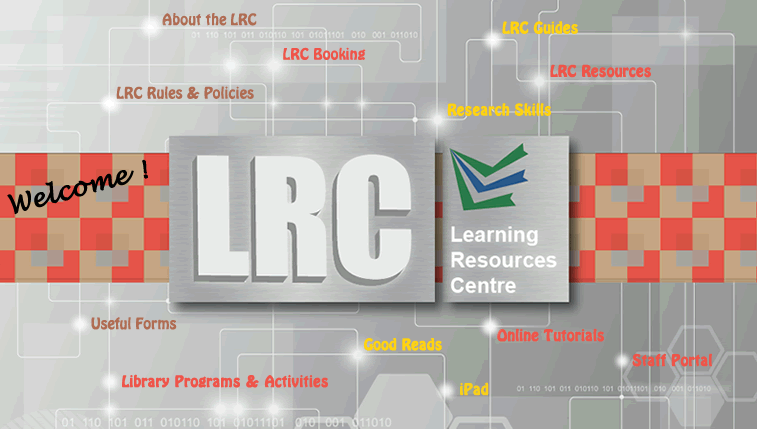 The LRC team can help you and their VLE page is incredibly detailed. Click on the image below to visit (you will get further guidance from the LRC team in support sessions 1 and 2.